Cybersecurity is something that shouldn’t be ignored under any circumstances. It is important to keep an eye on all happenings that relate to your cybersecurity. Getting proper awareness is key to avoiding any online threats. To learn more about cybersecurity, and its implications on our future, we’ve questioned Vahap Eren and asked him to share his thoughts on the present dangers faced by online population. Vahap Eren is a contributor for “Cyber Security Magazine.” He is also the author of the curriculum on “Field of Information Technologies, Cyber Threat Intelligence course program. Q – Hello Vahap, really excited to meet you last week. Thank you for accepting my invitation for interview to discuss about past, present & future of cyber security, privacy, & censorship. Please tell us a bit about yourself, Where did you born? Where did you get your early education? And what are 3 important things that you remember of your hometown? A – I was born in Malatya which stands on the east side of Turkey. My educational life is a little complicated. First, I studied post-foreign International Relations, Business Administration, and later I studied Computer Programming. I am still a graduate student in engineering management. Three things that I remember from my hometown is Apricot ;), clean air and good people. Q – When did you first thought of “Cyber Security” as a career? Do you think the “Internet” was always vulnerable to the cyber threats? What has changed in last 10 years? A – I used to see Cyber ​​security as a way to find security solutions rather than a professional job. Around 2010, cyber security was seen as occupation. If you ask from the beginning, I’ve been in the security area as an amateur since 2003 and I started doing this job professionally after 2011. The internet today is vulnerable against cyberattacks and the threats are high. More complex attacks can be carried out with ease. Especially with the increase in the interest of crypto coins, the financial scale of the attacks has also increased. Billions of dollars can now be made. For this reason, international measures should be taken against cyberattacks. Q – You work at itsecurity.com.tr. What is your role? What kind of services do your provide to your customers? What are some cyber security threats Turkish companies are facing? A – I work as a company manager at https://www.itsecurity.com.tr. We provide services to our customers on SOC – SIEM solutions, Penetration Tests and Forensic IT cases. The most common security problem faced by Turkish companies is Ransomware. It affects many companies and millions of dollars are lost to ransom attacks in Turkey. Of course, these attacks are generally due to the lack of awareness of users. Another reason is that companies do not want to make security investments. Q – You have co-written a well received book with İsmail Bülbül and Poyraz Emre Bingöl named “etik hackerlığa giriş 2, translated: An introduction to Ethical Hacking 2”. What intrigued you to write about the topic and why you thought of writing a book? A – Our book came out as 1 and 2. In the first book, we aimed to raise awareness of the users. When we look at the sales of the second book, we have seen a good rise. Our book contains completely technical information. I can tell you that someone who reads this book will retain a hacking knowledge that can be called over-the-top. When opportunity arises, we would like to translate and publish in English. In the content of the book, we gave forensics, kali Linux, metasploit, trojans, network attacks and many fields. Q – Since you wrote about ethical hacking that requires some threat model to locate vulnerabilities, every organization and individual must have some threat model of their own to protect against cyber attacks. What are 5 basic things do you recommend to start with? 1- First of all, it is very important to raise awareness of the people in the organization against cyberattacks. 2- I recommend that each individual participates in basic level cyber security awareness courses. There are resources on the internet related to this topic. 3- Institutions must have a leak test regularly. Not only that, he must force all his staff to attend cyber security awareness courses. 4- If we want to give an example in Turkey, there are a regulatory agency called BTK. And it compels IT staff in all institutions to take SOME training. The SOME (Cyber ​​Incidents Response Team) needs to be carried out on a global level. Turkey has taken a model example. 5- Users must obtain a good virus program. Free software is generally dangerous, so it is useful to get paid and have a good virus program. Q – You have an extensive experience of 15 years in Cyber Security, what are the cyber security challenges organizations from large to small ones generally face these days? A – The biggest challenge that organizations face is that they have a lack of awareness in cyber security. Nevertheless there are some people who think that these services are all the same. However the most important things in cyber security are intelligence, experience and information. Of course to separate these issues, you have to be informed. Therefore the companies that get service in cyber security may face great problems afterwards. Q – What security challenges does an average internet user face in the midst of rapid digital transformation? Many security experts emphasize on encryption. How does encryption can help normal users? What are your 5 recommendations for an internet user to secure data and privacy? A – In fact, after the recent data leakage, we have witnessed the importance of encryption. No matter how well you put your password, if you have not taken the necessary measures in the system you have defined your password, you can pass it to the undesired ones. Passwords of many global internet platforms are not kept in databases by md5, sha1, etc., and therefore are the reason thousands of people get hacked. Of course, the most important security measure is encryption, but I suggest you do this in different ways. It’s very important that you use a different password on each site. Or develop an algorithm and encrypt it. For example, if you used a password on site X,“ _/()=?_?=)(&%_?K=********)(&%_? “ on site Y “ _F/A(C)E=B?O_O?K=101)(&%_?,“ you can use a password, so the only password you need to keep in mind is “101.” This is my first recommendation. My second recommendation is to encrypt portable storage devices at all times. My third recommendation is to activate verification on all platforms that offer support of 2-factor encryption support. Choose the platforms that are crucial and provide end-to-end encryption in messaging programs. Fourth recommendation is perhaps the most crucial one. Use platforms that provide end-to-end encryption in messaging programs. My fifth recommendation is to use strong passwords. Q – Turkey has strict censorship legislation. What do you think of all this situation? How do you think of a use of VPN to unblock content and to access social networking sites? Is is inevitable? A – The use of a VPN for secure roaming on the internet is quite important. I recommend viewers to please stay away from companies that offer free VPN services. Many of these companies may be selling your data. Choose reliable and familiar VPN companies that include PureVPN. Q – Turkey faces 24.9% increase in cyber attacks in first half of 2018 alone, since privacy is a growing concern in Turkey, how does it affect cyber security? Does it increase cyber challenges for individuals and organizations alike? How Turkey is advancing in Cyber Security? A – After the reduction of the Russian aircraft incidents in 2015, Russian hackers used severe cyberattacks against Turkey. The Turkish government turned these attacks into an opportunity. Very serious investments were made and a great cyber security awareness was put forward. And serious investments related to this issue have been made and continue to be made. Many cyber security personnel are employed in public institutions. So I can say that Turkey has come, and will continue to go, a long way in the field of cyber security. Q – How do you see the future of cyber threats when artificial intelligence & automation is taking over the internet world and also when it is predicted that there will 1 Billion AR/VR users by 2025 (as recently quoted by Facebook)? A – I don’t see the future as innocent. Cyber ​​threats can reach serious levels in the following years. Users have to prioritize identity confidentiality. In the following years, I think that there may be many threats to our privacy. They need to increase their privacy levels. We know that many companies compete with each other to provide free internet service. Such services can potentially threaten privacy in the future. Q – You are a person who likes to keep himself busy. Other than professional commitments, what personal endeavors do you enjoy? What are your hobbies? Name your favorite sport, T.V show, and movie? A – I like to meet my friends most of my work. I usually go to the movies with them. In the meantime, I’m married and my wife also loves traveling. That’s why we participate in trips and enjoy meeting new people. My favorite sport swim, my favorite movie is I Am Legend, my favorite TV program is Masterchef. Q. Just for our readers, can you please send us an image of your workspace? That would be all. Thank you for your time. Cybersecurity should be given extreme importance in the modern era. Countries like Turkey have realized the importance if cybersecurity after suffering from cyberattacks from Russian hackers. Major Ransomware that spread last year have also put awareness in people’s mind regarding the importance of online security. 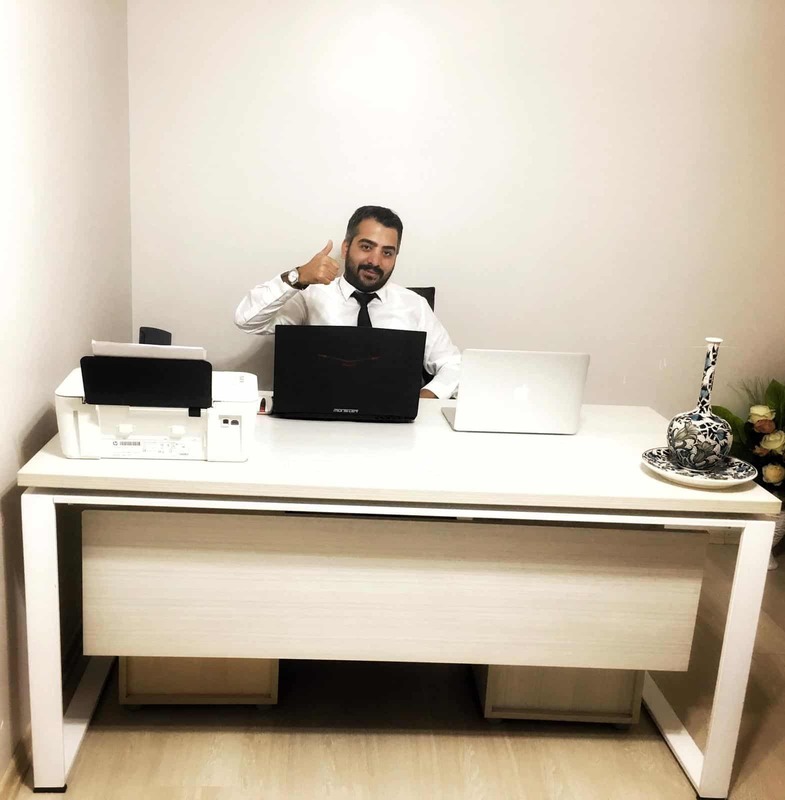 We hope that you have enjoyed reading Vahap Eren’s thoughts and we hope that you’ll follow his suggestions and recommendations regarding cybersecurity.